The book provides a comprehensive approach to configuration management from a variety of product development perspectives, including embedded and IT. It provides authoritative advice on how to extend products for a variety of markets due to configuration options. 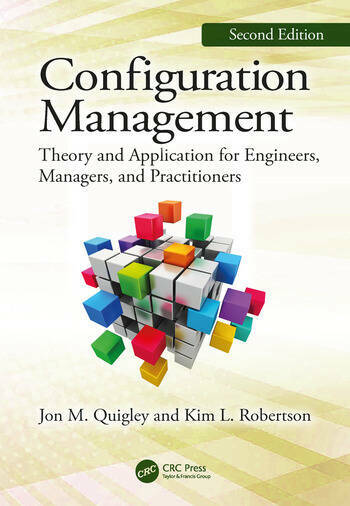 The book also describes the importance of configuration management to other parts of the organization. It supplies an overview of configuration management and its process elements to provide readers with a contextual understanding of the theory, practice, and application of CM. The book illustrates the interplay of configuration and data management with all enterprise resources during each phase of a product lifecycle. 2. Overview of Information Technology. 3. Configuration Management and Product Management. 4. A Configuration Item and What It Implies. 5. Data Definition, Data Types, and Control Requirements. 7. Configuration Management Support of Functional Resources. 11. When Things Go Wrong! 12. Test, Inspection, and Evaluation Master Plan Organized. 13. Assessing and Mitigating Risk. Jon M. Quigley has worked in a variety of capacities within new product development organizations, including embedded product development engineer, product engineer, test engineer, electrical and electronic systems engineering manager, electrical and electronic verification and test manager, and electrical and electronic process manager. Jon is on Western Carolina University’s Master of Project Management Advisory Board and Forsyth Technical Community College’s Advisory Committee for the Project Management Program. Additionally, he has taught project management at technical schools, Seattle City University, and a number of businesses. He is also an expert at IT Metrics and Productivity Institute (www.itmpi.org), where he has webinars on a variety of topics. Kim L. Robertson is an National Defense Industrial Association-certified configuration manager with extensive Configuration and Data Management as well as contract management experience in commercial, international, civilian and military aerospace. He is a member of the SAE G-33 Standard Works Committee for EIA-649, a regular contributor to CM Trends and various other trade publications, an industry consultant and lecturer. His interests in education and training development started in his teens. He lives with his wife and two dogs near Boulder, Colorado.